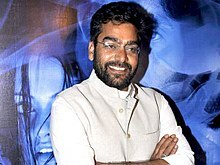 Ashutosh Rana Ramnarayan Neekhra (born 10 November 1967), known professionally as Ashutosh Rana, is an Indian actor, working in Bollywood, as well as the Marathi, Telugu, Kannada and Tamil film industries. He has also worked in Indian television shows. He has also won 2 filmfare awards for Dushman and sangharsh. He won these awards in the category filmfare awards in a negative role. Rana is from Gadarwara dist. - Narsinghpur, Madhya Pradesh state. He spent his childhood in Gadarwara, where he finished his primary school. He used to play the role of Ravana in the local Ramleela productions. He went to the National School of Drama, New Delhi and studied acting. He has done many plays with theatre guru Satyadev Dubey in Prithvi Theatre. Ashutosh Rana is married to Renuka Neekhra,/ Renuka Shahane also a Bollywood actress. They have two sons Shauryaman and Satyendra. Neekhra is a fervent admirer of his Hindu Guru "Pandit Dev Prabhakar Shastri Ji" whom he calls "Dadda Ji". It was Dadda Ji who suggested to Rana to take up the acting career. When Rana was about to enter the field of acting, Dadda ji told him to go to Bombay and meet Mahesh Bhatt and take any project which starts with the letter "S". When Rana got an offer of Swabhimaan from Mahesh Bhatt, he didn't wait for a second and grabbed the opportunity. He started his career with the television serial Swabhimaan, followed by serials like Farz, Sazish, Jax Kabhi, Waris and anchoring the TV show, Baazi Kiski. He also hosted Sarkaar Ki Duniya, a reality show which It took place on Mango Island in Karwar, Karnataka. Later, in 2010, he had acted in a Star Plus show Kaali- Ek Agnipariksha, where he played an extremely powerful negative role as Thakral. He had also played lead role in famous TV serial of Doordarshan, named Apradhi Koun. He became known in Indian Cinema after his movie Dushman, where he played a cold blooded psychopathic killer. He is mostly given roles of antagonists in movies, particularly that of a killer. And in some movies he played supporting roles. He has acted in South Indian films. He frequently appears in Mahesh Bhatt's films. He played the role of Alia Bhatt's father in Karan Johar's Humpty Sharma Ki Dulhania. He has acted in many Kannada films. He has shared screen space with South Indian Super Star Dr. Vishnuvardhan, a star of 220 movies in five different languages. He acted in the Kannada film Vishnu Vijaya, starring Akshay Kumar. He also acted with Dr. Vishnuvardhan in the 2005-released super hit film Vishnu Sena, and the 2007 released movie Kshana Kshana that also starred Aditya and Prema. 2002 Gunaah Ex-Havaldar Madhusudan Gokhale "Uncle"
1999 Won Screen Weekly Award for Best Performance in a Negative Role for Dushman. 1999 Won Zee Cine Award for Best Villain for Dushman. 2000 Won Zee Cine Award for Best Villain for Sangharsh. 1999: Won Sansui Award Best Performance in a Negative Role Dushman. ^ "FACE TO FACE with Ashutosh Rana". Indian Express. 17 April 2009. ^ "Tellychakkar.com > Interview >"I am reading Atharva Veda"". web.archive.org. 5 January 2007. ^ Rana The Times of India, 10 September 2007. ^ "Humpty Sharma Ki Dulhania Cast and Crew". Archived from the original on 27 June 2014. ^ "Vishnu Vijaya (1993) Kannada Full Movie Watch online". Ibollytv.com. Archived from the original on 8 December 2015. Retrieved 2 December 2016. ^ "Vishnu Sena Cast & Crew, Vishnu Sena Kannada Movie Cast, Actor, Actress, Director - Filmibeat". Entertainment.oneindia.in. 23 December 2005. Retrieved 2 December 2016. ^ "Kshana Kshana Cast & Crew, Kshana Kshana Kannada Movie Cast, Actor, Actress, Director - Filmibeat". Entertainment.oneindia.in. 1 June 2007. Retrieved 2 December 2016.